I have had whole families work on projects in the MAKESHOP. This was the first instance where I witnessed three generations create three separate projects at once. A very eager family came in and got right to work creating things. To my surprise, this was not the typical scenario. Instead, I found that the son was making his own “droid” while his Mom was making her own… while the Grandma worked on her own as well. 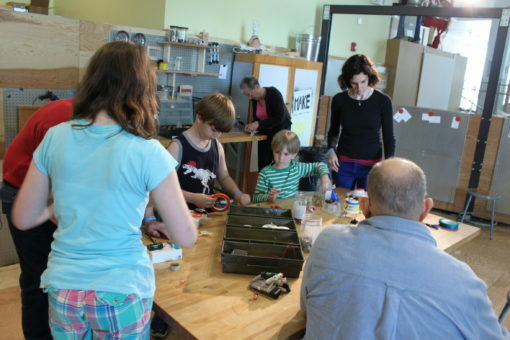 The MAKESHOP is a very family oriented space. We encourage both kids and adults to participate. This particular incident involving this family took the cake. I had so much fun interacting with this family. I’m interested in teaching children, but I am not opposed to teaching grandmas too. This was a great family experience; I am glad that I got to be a part of it. The projects turned out great and everyone had a spectacular time tinkering.